Why don't we just emulate the Fever API for use with TT-RSS? Well, I did. The plugin is attached to this post. Simply unzip to tt-rss/plugins/ and enable "fever" plugin via Preferences. Once you reload, you'll see a "Fever Emulation" tab at the bottom of the main Preferences page. Here, you will need to set a password specifically for use with this plugin (although it can be the same as your TT-RSS password), since Fever uses a different authentication mechanism to TT-RSS. 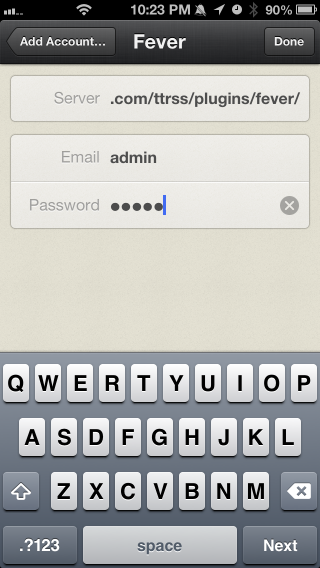 Once you set the password, you're ready to setup Reeder on iOS. 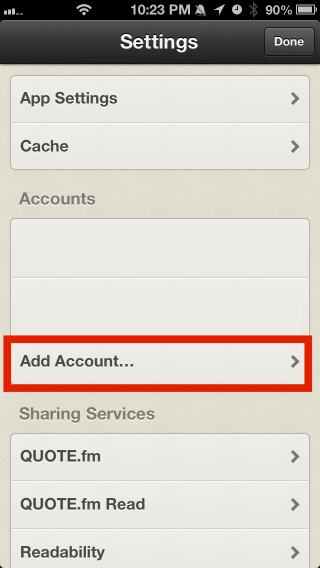 Open up Reeder on iOS, add a new account via the Settings page. Select "Fever" as the account type. 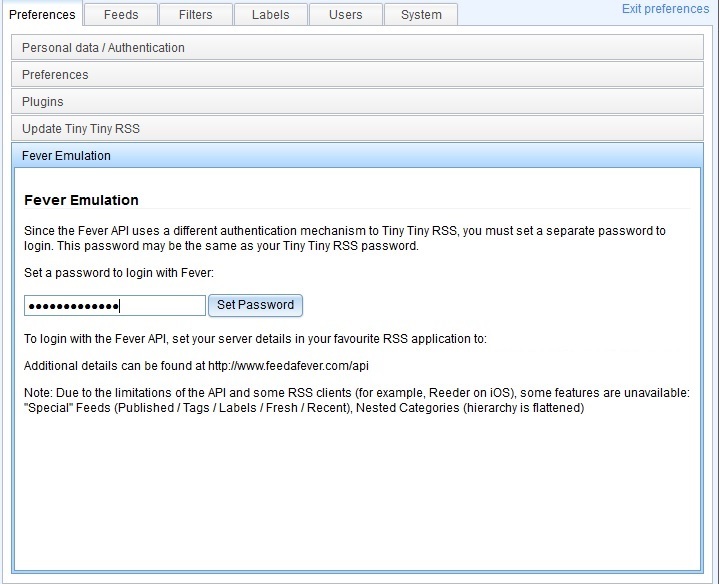 Fill the "Server" field with: http://your-ttrss-server.com/tt-rss/plugins/fever/ , The "Username" field with your TT-RSS username and the "Password" field with the password you entered in the "Fever Emulation" preferences. Hit Done...and things should start syncing! 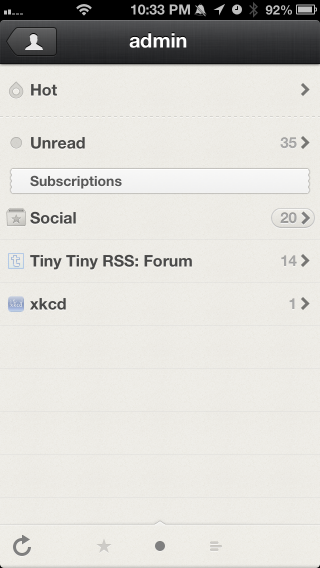 Note: Since Reeder doesn't have native support for TT-RSS, some of the more advanced functionality isn't available. For example, special feeds (like tags/labels), internal sharing features and nested categories (they are instead flattened) are not available. But hey, Reeder and TT-RSS! Hope you enjoy. I have thought of a way to add labels and tag support, but I will work on these at a later date. Also, I'm unsure how well this works with PostgreSQL, so YMMV. Last edited by DigitalDJ on 27 May 2013, 03:14, edited 2 times in total. Awesome plugin - thanks for your great work! Reeder was indeed the best Google Reader client for iOS - glad I can put it back on my homescreen now, at least on iPhone (Reeder for iPad doesn't have Fever support yet). Your plugin already has nearly everything I need for my mobile reading, worked right out of the box, no issues so far. Only shortcomings I have noticed as of yet (although those are probably limitations of the Fever-API or Reeders implementation of it): starred archived articles (migrated from GReader) don't show up in the Starred category and no swiping left to star in the article list. isarpirat wrote: Awesome plugin - thanks for your great work! 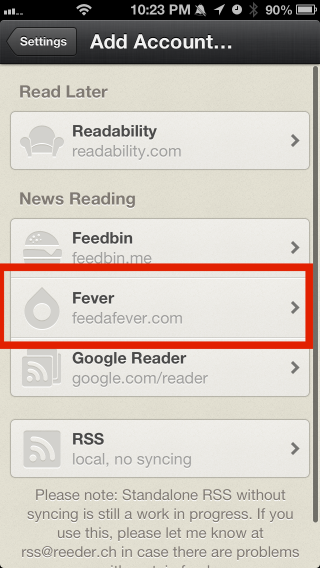 Hm Starring should work, but yeah...the archive feed isn't included since Reeder only allows one "Starred-like" feed. Any idea? I believe I've run through installing the plugin correctly. This would be amazing if I could get it to work, but I just seem to be getting 500 server error for some reason. Error 500 won't help me debug. Check your web server's error log or PHP logs. As for the warnings, I'm not sure what's going on here. What version of PHP, MySQL and TT-RSS are you using? Are you using single-user mode for authentication? I solved the 500 issue. It was because I used a symlink for the fever directory as I usually install 3rd party plugins in another directory and just symlink them into the plugins directory. I guess your use of things like chdir ../.. doesn't agree with this. Though now I have a different issue. Reeder tells me that the username/password is wrong. I might be wrong but it doesn't look like I can set the password in the preferences. I type a password into the box and click set password, but if I then exit preferences and go back into it again the password box is empty as if it hasn't actually set it? Also I don't get the "Password saved" popup. The ttrss_plugin_storage table is empty. Using Firefox and the latest trunk version of tt-rss from github. Investigated this in Firebug and can see that the data is being posted to tt-rss backend.php and it's receiving a 200 OK but there isn't any content in the response. The data is "op=pluginhandler&method=save&plugin=fever&password=test&csrf_token=80d5ae24da9e880591e5dab4deea92e3817628ad", but it's not actually being saved into the database. I'm wondering if this problem is that when you wrote the plugin you are using the mysql driver, but those of us who are having problems are using the mysqli driver or something like that? Last edited by xtaz on 07 May 2013, 16:37, edited 5 times in total. When saving the password I get a "Query failed:" from the ajax call. I am using TT-RSS v1.7.8, PHP 5.3.10 and MySQL 5.5.31. Actually, I'm using a trunk version of about 1 week old. Maybe that's the issue. However, give this one a shot. Doubt it'll work, but hey. Will try to go to trunk but last time I tried I had some issues with git on my server ! This version works for me now. I'm actually using the latest trunk version myself. But yes, just tried this 1.1 version and it lets me set the password. Okay, cool. I believe the "PHP Warning: Missing argument 2 for db_query()" errors are related to not having trunk. I'm using PHP54, mysqlnd 5.0.10, and tt-rss v1.7.8. I am not running single user mode. I noticed that I could not log in with Reeder, and I am getting the Warnings when I click Save Password. I'm pretty sure that part is failing, which would explain why I can't authenticate using Reeder. DigitalDJ wrote: Okay, cool. I believe the "PHP Warning: Missing argument 2 for db_query()" errors are related to not having trunk. I would say it's related to this: viewtopic.php?f=22&t=1859 , so yes, people will either need to use trunk, or wait for 1.7.9.